Have you met Mizzie? She’s the gorgeous Aussie teething toy who’s hopped on the scene to steal the hearts – and gums – of babies across the country. Designed by Australian parents and made of soft, safe natural rubber, she’s here to soothe sore gums and fascinate little fingers with her squashy body, bright colours and sunny smile. Her soft texture is ideal for relieving teething discomfort and engaging your baby’s developing senses. Her natural rubbery smell is pure and gentle for small noses. Give her a cuddle and she’ll thank you with a happy squeak! Mizzie is small and soft enough for infant hands to grasp and free from nasties like PVC, BPA, Nitrosamines and Phthalates. Individual hand painting with non-toxic dyes ensures every Mizzie teething toy is unique. No wonder she has a family of fast growing fans all across Australia. 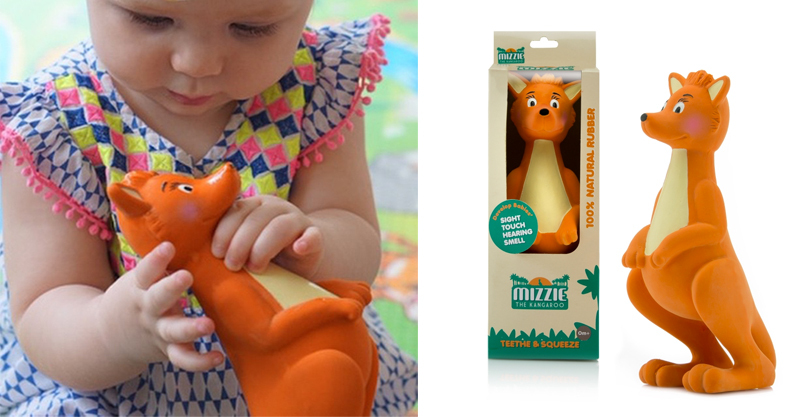 Mizzie The Kangaroo costs $25.95 plus $5 postage Australia wide or check for a stockist near you.